The collection of monuments on the walls of the historic St Georgeâs Cathedral and in its churchyard is one of the best in the Caribbean and part of the art history of St Vincent and the Grenadines. Reverend Father Charles Card-Reynolds, of the Diocese of London, in a lecture delivered at the Cathedral on November 28 said these monuments constitute a major sculptural art collection, which was specifically commissioned by the colonial elite who lived on St Vincent about 200 years ago. Card-Reynolds said while the monuments mostly commemorate enslavers or those whose livelihoods were connected with enslavement, they are an important part of the countryâs history and he is worried by present day academic and political movements that are fuelling a process of getting rid of monuments or reminders where there is something challenging or objectionable about that history. âAs a Christian priest, I find this tendency worrying …because spiritually, I fear it may tend towards a certain Puritanism and self-righteousness. But more troubling, that once we have cleansed all of the reminders of monuments and things that we may well wish to challenge or ask questions of, what will there be left for us to see and be reminded of that story? âWe are foolish to think that if by cleansing ourselves of such images that history canât repeat itself. It is good to have things sometimes around us sometimes that are provocative, that make us think â works of art from a past era that pose questions to us in the present, even if we feel uncomfortable or angered by that at times,â he opined. In his well researched and stimulating lecture, Card-Reynolds gave the local political, social and ecclesiastical context in which the monuments were commissioned. He explained that the West Indies, during the 18th and early 19th centuries, ranked only after India in importance in the British Imperial system, because of the âunprecedented wealth that could be gained from the production of sugar. It is in the context of this vast and new wealth accumulated by the colonial elite that a considerable number of monuments were commissioned and installed by West Indian families, Card-Reynolds said. to understand what we see in the monuments and more particularly, some of the references in the inscriptions. âIn less than a generation, Hairoun had endured almost complete social and cultural transformation and had emerged into the colony of St Vincent. The French population, never large, was reduced in numbers and socially marginalized; the Amerindians and Black Caribs were drastically reduced in numbers and those who remained were pacified, while simultaneously, during this period of expulsion, large numbers of enslaved Africans were brought to work on the plantations and for the associated economy. âThe monuments then need then to be read in this context of an entirely new, but also very precarious society,â he said. He also noted that during the 18th and into the early 19th century, the Anglican church in the West Indies, unlike in England, was subordinate to the State, which ruled and regulated the life of the Church. âThe Church was not an independent partner to the State, but tended to act like the governmentâs ministry of religion,â with the Governor ruling the church as much as he governed every thing else, even having responsibility for appointing the clergy and could dismiss them as he chose. He said the few clergy that served ranked alongside the higher and middling colonial officials and were maintained and paid for by the plantocracy for their own purposes. One monument which gives a good example of this is the monument to the Honourable and Reverend Nathaniel Struth, who died in 1847. The epitaph describes him as Speaker of the House of Assembly, Justice of the Peace and a Stipendiary and Police Magistrate. âBut there is no mention whatsoever of any ministry that he exercised,â Card-Reynolds mused. He pointed out that the monuments show strong emphasis by the colonial elite on claiming status and pedigree within the inscriptions and declaring their high education and refined taste and being recognized by others for having those qualities. âAnd if these things were not exactly true of an individual or a family, then an expensive and exquisite monument could conjure the appearance as if they were true,â he noted. During the lecture, Card-Reynolds led the nearly 100 people in attendance on a walk-around of the Cathedral, looking at specific examples of the monuments. He said the oldest of the monuments are in the the churchyard, and they date back to the early 18th century, the grandest being an obelisk in memory of Sir William Leybourne Leybourne, who was the governor of the âsouthern Caribe islandsâ who died in 1775. He said It is almost an exact replica of a tomb that was found in Belvedere in Rome. He said the monuments could be a stimulation for artists, writers, and historians and a valuable component in developing the cathedral as an engaging place for educating and engaging with visitors. 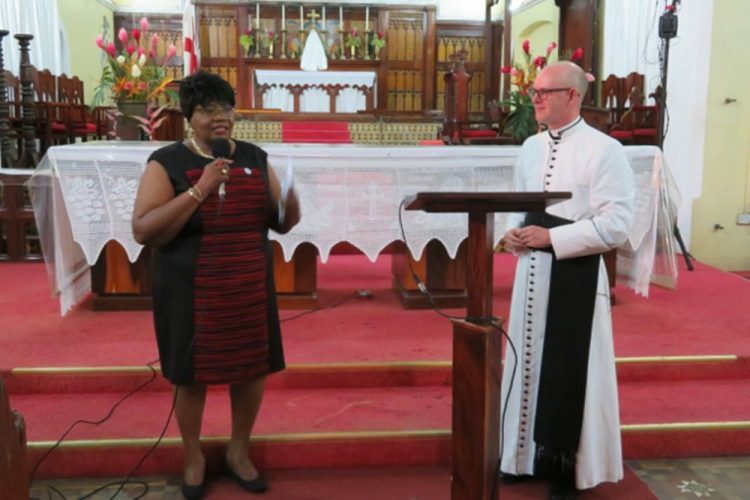 In her vote of thanks, RenÃ© Baptiste, chair of the restoration committee of the Cathedral, complimented Card-Reynolds on doing a âwonderful jobâ with assisting the church with its continuous work on the restoration and conservation of St Georgeâs Cathedral. She said his presentation gave insight into the large volume of work which was required for the restoration and conservation of the Cathedral, which was consecrated in 1820. Baptiste disclosed that preliminary estimates run into the millions of dollars. Activities at the Cathedral have been restricted since December 2015, when a visual inspection by two civil engineers indicated the presence of crack at the top of a column above the congregation seating area near to the pulpit.